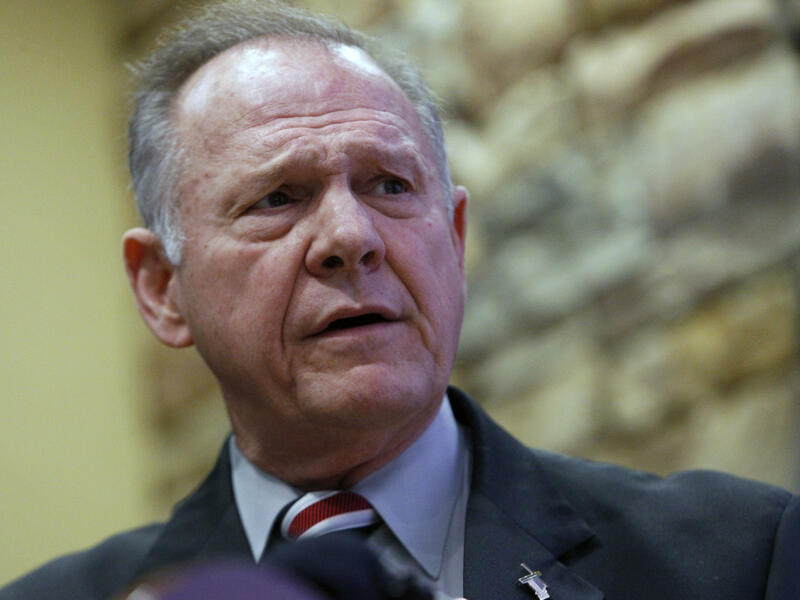 U.S. Senate candidate Roy Moore speaks at the Vestavia Hills Public library, Saturday, Nov. 11, 2017, in Vestavia Hills, Ala.
"Please stop using the phrase 'sexual misconduct' to describe Roy Moore's alleged abuse of children. The allegations are about sexual assault, sexual abuse, sexually predatory behavior. 'Sexual misconduct' doesn't cut it," wrote Marjory Ruderman, of Charlottesville, Va.
NPR should always use very clear language when describing any situation. As Mark Memmott, NPR's standards and practices editor, often points out, the best language is to give the actual facts, to the extent they can be known; labels should be secondary. That means including the ages of the alleged victims, or descriptions in their own words, of what they said happened to them. But labels are also sometimes necessary for the fluidity of the narrative, and in particular for headlines and for newscasts, where the amount of space or time for detailed description is limited. We went back and looked at the many stories devoted to the Moore allegations, as well as some of the other recent coverage of sexual harassment and abuse. For the most part, the reporting has been quite clear. Even the story that used the inexact phrase "very young women" also called them "teenagers" and specified the age (16 at the time) of one of the alleged victims. The story also quoted her saying, "And he then looked at me, and he told me — he said, you're just a child." I don't believe any listener would have come away misled. As for the phrase "sexual misconduct," NPR has used it quite a bit. Perhaps too much; it's a convenient catchall, but it means different things to different people. At the same time, many of the stories that use the phrase, either in the headline or in the story itself, also include sound bites of the accusers, which include more detail. Still, NPR should sharpen its language in these stories. As Memmott wrote in recent guidance to the newsroom, "To only say he's accused of 'misconduct' or 'inappropriate' behavior does not reflect the seriousness of the accusations." In this instance, as well, Memmott's guidance is "to keep using words and phrases that underscore the severity of what happened."